Thread: 1996 Pacific Printing Plates? I just got a printing plate from of Biggio from 1996 Pacific Collection, but when I looked on Beckett and my list...There are no printing plates listed? Beckett doesn't recognize them since they were not released in packs like most plates are. How were they released then? Are there still 4? Black Cyan Yellow and Magenta? I'm willing to bet that is a fake plate. Here is why. 1. Foil is applied after the printing, so anything that is foil on the card would not show up on the plate. The pacific logo looks like foil on the base card, yet it shows up on the plate. 2. Look at the top of the plate and it is nearly even with his hat. If you look at the card, there is more picture showing. The plate image would never be smaller than what is shown on the card, as it is transferred from plate to card. When you fake a plate, (going from card to metal) the image is always shrunken like this plate. I would get your money back. I will let the person who brought it for me to report it. I agree here. I admit I got taken on a few of these years ago. I really don't know who would fake them though, as the ROI doesn't seem high enough. But as @IUjapander demonstrates, the foil is a dead giveaway. Foil application isn't 100% precise, and if you printed cards like this and then applied the foil, you'd often times have a "dropshadow" effect because placement would be a little off. I recommend staying away from any of the Pacific non-pack issued printing plates on the market. Do you think they could have printed an outline to where the foil is suppose to go on the card? I have seen regular cards that were missing the foil on the name but the name was still there in black. While I can't say for certain on every card ever produced about 99% of the time they would not have an outline, and would need to see an example of what you are referring to see what happened. Like @gracecollector said foil application is not perfect, hence why they would not print something, and then put foil over it. Notice "Ryan Doumit" and "C" is in foil on the base card. While I don't have the fourth plate, look at how neither of those show up on the plates. Here is an example of foil applied after printing, if it was a printing error the whole card would be off, but this is just the foil that has gone wrong. Here are legit pack-pulled 1997 New Pinnacle and Pinnacle Plates and base card. See how areas where foil is applied is left unaltered, unless a dropshadow effect is intended. 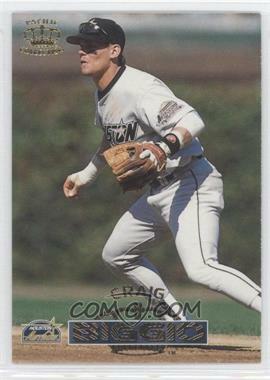 And specifically on the 1996 Biggio plate, I don't think those lines in the name "Biggio" above would be on the plate, as the raised and lowered effect was created by embossing the foil at different heights, not by printing ink. You had someone buy for you? I wish them luck in the now fight with the seller about it being fake, not wanting it, maybe not paying lol... hopefully the seller just owns it and lets it go away for your sake! Good! FCB and its vast knowledge helps again!